UPDATE 2/5/16. We announced this project on Wednesday February 3, 2016 and the response has been incredible! All over the country, people have donated from Australia to New York, England, France, Canada, Singapore, the SF Bay area and cities in between. We are overwhelmingly grateful for everyone's generosity and support and are so happy to say Alia has reached her goal of 500 rocks in just 2 days!! This speaks to the kindess of people banding together quickly for a good cause. 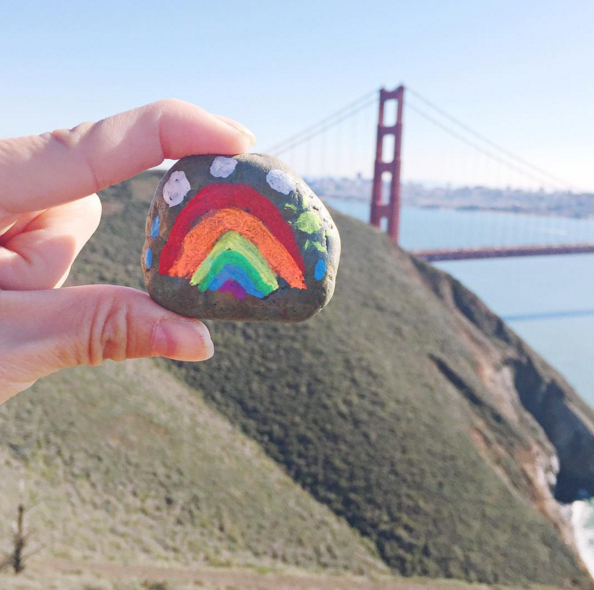 To keep the Rainbow Rock Kindness momentum, we are going to up the goal to 1000 rocks this year and will personally match donations if we reach that goal for a potential of $2000 donated to Alia's charity of choice, The Bay Area Rescue Mission. With the influx of rock orders, Alia will be getting help from her friends to paint these rocks as soon as possible and scatter them in the "universe" to spread kindness. THANK YOU all for your support and generosity from the bottom of our hearts. UPDATE 3/1/2016. We reached our goal of 1000 rocks! As we stated above, we will match all donations up to 1000 to the Bay Area Rescue Mission. We are going to keep the initiative going and every dollar donated after 1000 will of course continue to be 100% donated. THANK YOU for your generosity. We are forever changed by the kindness of family, friends, and strangers across the world. In case you are wondering, to date, 263 rocks so far have been made and sent out in the "universe." This has always a been a year project so we promise we are catching up as fast as possible to make sure every single rock is accounted for each one sponsored. UPDATE 4/30/16. Alia visited the Bay Area Rescue Mission today and gave them a special check of $2132 for all the money raised so far for the #rainbowrockproject. We got to tour the facilities and learn about the Mission's cause and how the money would be used. We visited the kitchen where 1000 meals are served a day, the donation center where toys, clothes and food are sorted, and the living cots for men and separately women and children. It was an amazing lesson and we learned a lot. We will be back. And want to thank our family, friends and YOU for all your awesome support for the project! P.S. We'd love for you to join in spreading kindness and you don't need to donate to do that! Just make your own rainbow rocks and share them with the hashtag #rainbowrockproject so we can see and share back! Make sure to follow our rock adventures on Instagram! (@rainbowrockproject). And also tag us if you find one of our rocks! UPDATE 4/4/17 - We've partnered with PLAE shoes to give back to Alia's cause, The Bay Area Rescue Mission! Alia got to design her own custom rainbow shoe tabs! Use code GIVE699 on any shoe orders on PLAE's site where 10% of purchase value will be donated to The Bay Area Rescue Mission (code does not expire). If you order before 4/9/17, you will get a free set of Alia's rainbow tabs! Learn more HERE. UPDATE 5/24/17 - Alia's PLAE shoe designs raised an additional over $5K for her cause The Bay Area Rescue Mission! See her reaction to the news HERE!